Plan the Perfect Baby Shower! "I love this site. I have planned 2 baby showers in 2 months, and this site has been my bible. I don't know where I would be without ya'll. Thanks so much. Jodi "
As a sister, cousin, sister-in-law, friend, and coworker, planning showers for my friends and family is becoming more and more frequent because it seems like everyone is pregnant these days! And planning a shower can become extremely overwhelming because you want it to be “PERFECT”, right? There are so many baby shower ideas, themes, and games floating around, that it’s easy to get overwhelmed by it all! And NO ONE has the time or energy to sort through the countless number of websites trying to piece together the perfect party for the special, soon-to-be mother. Talk about stress!! But it doesn’t have to be stressful – not with this website helping you! As you look through these pages, you will find the best, the cutest, and the most enjoyable games, ideas, themes, invitations, gifts, favors, cakes, decorations, and everything else you will need to make this the Perfect Shower! Cake pops make the perfect sweet treats for any kind of party. These bite-size confections have become wildly popular in the last few years, come get some how-to help, ideas, themes and other cake pop inspiration! Check out Mindy's Retro 80's Video Game Themed Baby Shower! She has some rad ideas for an awesome and unique shower, including Ms Pac Man invitations, favors, food and games. Grab your hair spray and get ready for a sweet 80's party! Non-alcoholic mocktails are the key to turning a baby shower into an elegant and delicious shower! They can be just as colorful and fun as real mixed drinks, but everyone can enjoy them – including the mom to be! Here are some awesome recipes to serve at your party! What does a Royal Baby Shower look like? Find out how Kate Middleton celebrated her royal pregnancy! If you are looking for a new and unique theme for your shower, here are 2013's hippest themes that will have all your guests celebrating in style! It is just common knowledge, and a common joke, that all pregnant moms crave certain foods throughout a pregnancy. What a fun theme for a shower! Here are some great ideas to help you plan the perfect Craving Baby Party! The results are in and the 2013 colors are here! Emerald Green, Lemon Sorbet, Monaco Blue and more! Find out what the color trends are for 2013 so you can incorporate them into your party planning to give your shower the latest feel! Here is a review of the most popular baby shower trends for 2012. These are hip, cute and downright clever ideas and trends that will help you in your shower planning for 2013! 3. You can personalize them! 4. They are a great choice for a girl, boy or both! How do you make the perfect diaper cake? Just take a look below! This diaper cake is AHHH-MAZING! Misti sent us her yellow ducky diaper cake from the great state of Texas. Celebrate the 'little chic' in your life with these dreamy little chic invitations! Designed exclusively for this website, you won't find these anywhere else! They are free and you can personalize them with your own wording. See how Posh Spice celebrates her very first baby girl! Friends Eva Longoria and Ken Paves throw Victoria a lovely English Garden Tea Party. It was a very pink party! Tambra submitted her photos and details of the shower she threw for her daughter-in-law and her son - and what a PARTY! 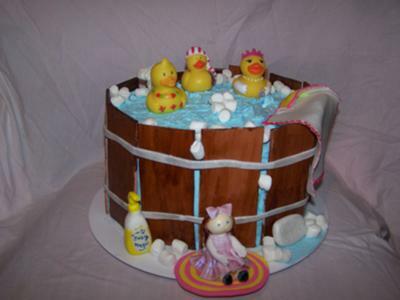 Your shower guests would dive right into this EDIBLE rubber ducky cake! This is such an adorable cake made with cake, cream cheese frosting and fondant...Liz submitted this adorable cake to give us some inspiration! We have created a new, stylish and chic shower invitation for you! It is free, printable and available right now! It is a cute silhouette of a pregnant woman, with some stylish colors and designs. You're gonna love it! This baby boy bottom cake is SO creative! We have the greatest ideas for edible shower cake ideas from our readers, and this one from Erin is darling. She shares how she made it and a few tips. Take a peek! This diaper cake is so full...full of CHIC! Lynn, one of our wonderful readers, has done it again and submitted another fabulous diaper cake. This time it's a cake made from Huggies limited edition denim diapers. Such a fun idea! No matter if you do your Dr Seuss shower in the rain, on a train, in a box or with a fox your, with these cute ideas, it's sure to knock off everyone's socks! A fabulous way to celebrate a new baby is to take care of the world that he/she is being brought into! Here are some great eco-friendly ideas that will help your shower go green. Pregnancy is a BEAR! So throw a Teddy Bear shower to help the expectant mother along. Here are some truly creative and vintage ideas for a Teddy Bear shower, including free printables, invites, favors, games, food and decorations. 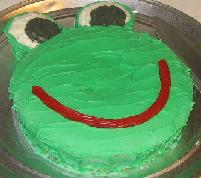 Denise, one of our incredible readers, shares with us all her creative ideas for an adorable frog themed shower, including ideas for decorations, favors, games, food and diaper cake. ADORABLE! This nursery rhyme Jeopardy game is a definite crowd pleaser and a lot of fun to play in a large or small group. How well do YOU know your nursery rhymes? If an expectant mother has colder feet during her pregnancy than before, is she having a boy or girl? Find out when you play this fun & free printable shower game! If you want your shower to be a little bit of heaven on earth, check out these cute ideas for a Baby Angel Shower! Check out these cute homemade invitation ideas that our creative readers have submitted. This fresh fruit bouquet is a unique and striking centerpiece for your shower AND it is a tasty addition to your refreshments. Find out how to make a fruit bouquet with these easy instructions. Cute baby bingo cards. These cards are free, easy to print and ready to play! Celebrate a Sweet Pea Baby Shower with these darling ideas. All your planning has been done for you with these fantastic sweet pea favors, invitations, decorations, food & centerpieces. Detailed instructions & pics for an EASY to make yourself shower favor that is really cute, really inexpensive, and really simple. Your guests will love it! How to make a diaper cake instructions & photos. It takes about an hour or so to make a diaper cake, and it will turn out looking SO cute! These free printable invitations have saved many-a-hostess a lot of stress and time in preparing their shower invitations. 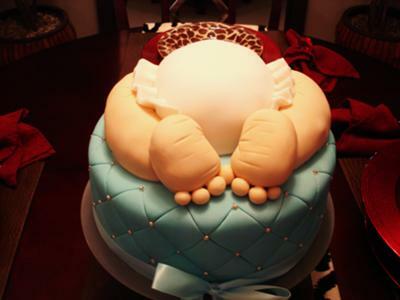 Check out the fabulous diaper cakes that readers of this site have made! Get ideas, instructions, & pictures of how to make your own diaper cake. Find out how much (or how little) we know about the baby celebrity showers for Kate Middleton, Kourtney Kardashian, Britney Spears, Angelina Jolie, Gwen Stefani, Katie Holmes, Heidi Klum & more! Instructions on how to make a baby sock rose bouquet - with pictures. 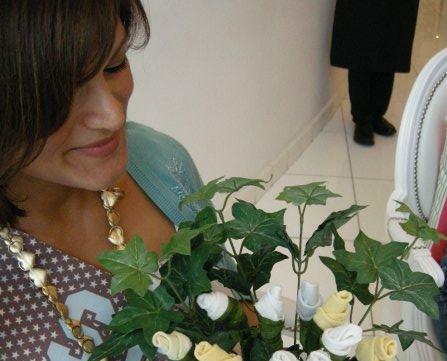 These baby sock flower bouquets look gorgeous and surprisingly real! This is an inexpensive, fun and tasty favor idea that you can make yourself. Here are the detailed steps of this easy-to-make shower favor with a picture. Unique, fun and completely free printable shower games. Everyone will be raving about how fun the party was after playing these games! If you want to play a cute & clever game at your shower that is NEW and unique, try this! It is the original baby shower scavenger hunt. Here are the 3 best decorating ideas that will help you create a fun & classy atmosphere for your shower - without spending a lot of money! First thing is first, we need to choose a shower theme, because everything else is affected by the theme you select. Now, once you have a theme, let's plan your invitations... Next come the games... Then the favors, decorations, food, and gifts! We will wrap everything up with some cute thank you cards and before you know it, you will have successfully hosted a fun, cute, and unique shower. Here is a comprehensive checklist to make sure you don't forget a thing! _____________________________________________________ Here are some Free Printables that will help make your party planning MUCH easier: GAMES INVITATIONS THANK YOU CARDS _____________________________________________________ Above all, have fun with this! Birth is truly a miracle, and you are helping everyone to celebrate it with the Perfect Shower! Planning a Baby Shower? You'll have everyone talking about how fun the party was after using these fun and free ideas to plan the Perfect Baby Shower! New, fun, and unique Baby Shower Themes! You will have everyone talking about how fun the party was after using these free Baby Shower Themes! New, fun, and free Baby Shower Invitations! You'll have everyone excited about the party after you use these free baby shower invitations & ideas! Hip Baby Shower Invitation Wording Ideas! Here are some fabulous baby shower invitation wording ideas with many different poems, verses, and sayings to choose from. Sweet Baby Shower Poems for girls, boys, or twins! Free and Fun Baby Shower Poems for baby boys, girls, and twins! Perfect for invitations, announcements, & cakes. New, fun, and free Baby Shower Games! You will have everyone talking about how fun the party was after playing these Baby Shower Games! New, fun, and unique Baby Shower Favors! You'll have everyone at the party oohing and aahing when they see your Baby Shower Favors! Cute, fun, and creative Baby Shower Decorations! Everyone at the party will love these unique Baby Shower Decorations! These unique and beautiful baby shower centerpieces will impress you, the mom-to-be and all of your guests! 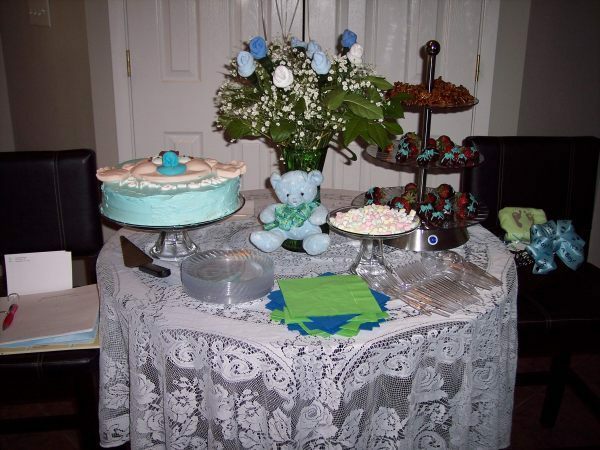 Diaper cakes, chocolate fountains, flowers and creative homemade centerpiece ideas. New, fun, and delicious baby shower food and menu ideas! These baby shower recipes will give your party the perfect touch! New, fun, and unique Baby Shower Ideas! You’ll have everyone talking about how fun the party was after using these free Baby Shower Ideas! Throwing a Couples Baby Shower? Here are some helpful hints on planning a Couples Baby Shower - Including games, invitaitons, food, favors, and whether or not to invite the guys! Find out how the celebs celebrate their celebrity baby showers! What kind of baby shower would you throw if money were no object? Find out what kind of lavish and swanky celebrity baby showers the Hollywood celebs throw! Throw the perfect baby shower with these new, fun, and unique Baby Shower Party Ideas! These are the latest trends in baby shower invitations, games, favors, food, and gifts! New, fun and free Baby Shower Thank You Cards! These free printable Thank You cards are the perfect way to thank your guests for coming to the party! Detailed, step-by-step instructions of how to make a diaper cake. Baby Shower Cakes are a perfect touch to your party! These baby cakes, or diaper cakes, are all the rage these days. New, fun, and unique Baby Shower Gifts! You'll have everyone at the party oohing and aahing when they see your Baby Shower Gift! What is proper baby shower etiquette for the perfect baby shower? Here are answers to all sorts of questions about what is "proper" etiquette for a baby shower. Search for the Perfect Baby Shower Ideas! Search the biggest selection of baby shower ideas, games, invitations, favors, themes, decorations, food, diaper cakes and many more creative ideas that will help you plan the perfect baby shower! Tell me about your best baby shower stories and experiences. Aquí hay varias invitaciones para baby shower que Ud. puede imprimir gratis! Si Ud. busca invitaciones para niña o niño, aquí las encuentra. Encuentra muchisimos ideas para recuerditos de baby shower que van a gustar a todos los invitados! Estos recuerditos de baby shower son originales, divertidos, y especiales para la futura madre. Los mejores juegos para baby shower que Ud. puede encontrar en el internet están aquí mismo, son gratis, divertidos y originales. ¡Les van a gustar a todos los invitados durante la fiesta infantil! Make the cutest baby shower crafts with these free, easy-to-follow directions with pictures and tips. Learn how to make your own baby shower favors, decorations, centerpieces & gifts! Brazil - Portuguese - Ideias lindas para o Cha de Bebe em portugues - incluindo convites, jogos, decorações, perguntas, em mais! !